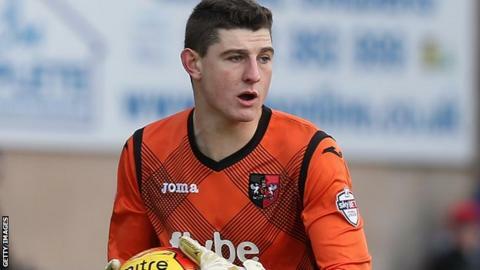 Exeter City goalkeeper James Hamon says he is looking forward to playing some first-team games after making a month-long loan move to Hayes and Yeading. The 20-year-old from Guernsey has not featured for Exeter's this season after the summer signing of Bobby Olejnik. Hamon played 22 games last season after making his debut in October 2014. "There's nine games in the month that I'm there, so to get nine games under my belt is going to really good for my development," he told BBC Guernsey. "It's been disappointing not to play much at Exeter after last year, but this loan move is all about getting games,"